In the course of understanding the mechanism and therapy of atrial tachycardia, important distinctions are emerging in electrophysiological evaluations of various atrial arrhythmias, which come under scrutiny in this latest addition to the CATA Series. New diagnostic tools and more accurate understandings of atrial anatomy allow finer detection of the clinical and electrocardiographic presentation of cardiac arrhythmias. With invasive electrical mapping, intracardiac ultrasound imaging, and catheter ablation, multiple distinct arrhythmic mechanisms can be recognized and the substrate treated for a variety of tachycardiac conditions. The aim of the Clinical Approaches to Tachyarryhthmias series is to update the physician, cardiologist, and all those responsible for the the care of patients with cardiac arrhythmias. This comprehensive review offers cardiologists and electrocardiographers the latest knowledge in what is an evolving field, as innovative techniques drive the ability to diagnose and treat different tachycardia types with new interventional approaches. 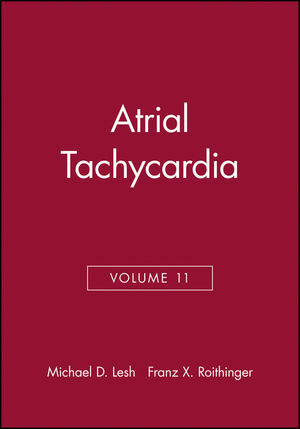 Michael D. Lesh and Franz X. Roithinger are the authors of Atrial Tachycardia, Volume 11, published by Wiley. 1. Clinical and Electrocardiographic Presentation. The Role of P Wave Configuration. 2. Electrophysiologic Characteristics and Diagnosis. The Role of Newer Technologies for Mapping and Ablation of Atrial Tachycardia. The Role of Atrial Anatomy. V. Atrial Fibrillation as a Manifestation of Focal Atrial Activation. VI. Incisional Intraatrial Reentrant Tachycardia.